NETGEAR Push2TV Wireless Display Adapter enables you to mirror whatever is displayed on your Kindle Fire HDX, Intel WiDi, or Miracast-supported smartphone, tablet, or laptop screen on your HDTV, wirelessly. Your Push2TV now supports Kindle Fire HDX. 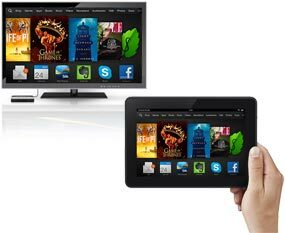 Enjoy Amazon Instant Video or anything that is displayed on your Kindle tablet on your big screen TV. Push2TV can be powered using a USB port on your TV. If the TV does not have a USB port, Push2TV also comes with a standard power adapter that plugs into an electrical outlet. Smaller than a standard pencil, the Push2TV adapter allows for simple placement and makes it easy to carry around when travelling. Push2TV supports Intel WiDi and is Miracast certified, so you can wirelessly display more of your devices on TV in up to 1080p HD. Wirelessly display content in up to 1080p HD video resolution. Flexible power option by using the USB port on the TV. Small size for easy placement and portability.